Summary: This winter has been an especially long one, and we find ourselves longing for sweet treats that won’t make us feel too guilty. Nothing is more satisfying on a cold winter’s day than a piping hot bowl of apple crisp. If you’re following a vegan, gluten-free diet, you might wonder how you can enjoy this succulent treat without butter and dairy-based ice cream. Have no fear, the dessert can be made to your specific dietary needs. We think it tastes even better than the milk-infused version. This winter has been an especially long one, and we find ourselves longing for sweet treats that won’t make us feel too guilty. 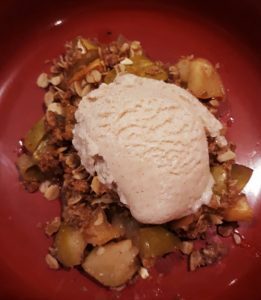 Nothing is more satisfying on a cold winter’s day than a piping hot bowl of apple crisp. If you’re following a vegan, gluten-free diet, you might wonder how you can enjoy this succulent treat without butter and dairy-based ice cream. Have no fear, the dessert can be made to your specific dietary needs. We think it tastes even better than the milk-infused version. 6-8 medium-sized apples (enough to make 6 cups. You can use several different types at once, from tart to sweet). Hearty and Delicious Vegan, Gluten-Free Apple Crisp Chop apples into chunks. You can remove peels if you like, but it’s not really necessary. Peels are full of vitamins. Pour apple chunks into a large bowl and sprinkle them with lemon juice. Add turbinado sugar, cornstarch, cinnamon and salt. Toss mixture until thoroughly combined and spread into greased 9X9 pan. We used coconut oil for the coating. It has a sweet, subtle flavor that is great for this dessert. Meanwhile, wash and dry bowl so you can re-use it. Combine brown sugar, flour, oats, melted butter, almond meal, cinnamon and salt until the consistency is similar to wet sand. Spread evenly across the top of the apple mixture and pop into a pre-heated, 375 degree oven. The mouth-watering scent of apple crisp will fill you with anticipation and nostalgia as the dessert heats up in your oven. Let it bake for about 45 minutes, until the top is golden brown and slightly bubbly. The apples should be soft but not mushy. Place the pan on your counter and allow it to cool for about 15 minutes. Serve toasty warm! This dessert is great by itself or with a scoop of vegan ice cream. It’s big enough for 6-8 people, so be sure to invite everyone you know. You won’t have any shortage of friends. Cheer up – spring isn’t so far away after all. Read Next Article » Vegan Gluten-Free Garbanzo Pancakes—Good for Any Time of Day!